WHY: Renowned French Chef, Paul Pairet of "Mr & Mrs Bund" and "Ultraviolet" needed a portrait for promotional and media usage leading up to the opening of "Ultraviolet." Limelight Studio wanted to place Pairet in front of the projection screen since it is such an important aspect of the multi-sensory restaurant. This particular projection of the spiral was chosen because it resembles the shape of a snail. The snail represents escargot, a classic French cuisine, which ties back into Pairet's French background. HOW: We used no additional lighting on this shot as we used the light from the projector as a key light, while the remaining ambient light was used as fill. 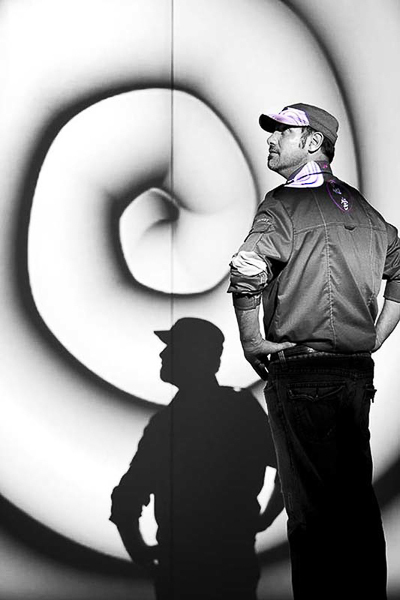 In postproduction, the photograph was transformed into black and white with the exception of the purple spirals projected onto Paul. We don't normally like to do color isolation, but it was fitting in this case. This was done to draw an extra emphasis on the projections, to highlight Ultraviolet's signature color, and to remind the audience of the unique experience that Ultraviolet provides when dining at their restaurant.